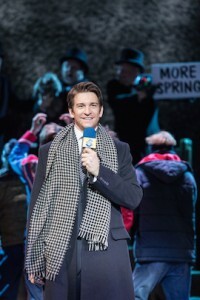 Groundhog Day won Best Musical at the U.K. Critics’ Circle Theatre Awards today for its Old Vic Theatre run! Groundhog Day won The Peter Hepple Award for Best Musical today, at the U.K. Critics’ Circle Theatre Awards. The presentation ceremony, hosted by Mark Shenton, took place at the Prince of Wales Theatre, London. For a list of all the winners, please take a look here. 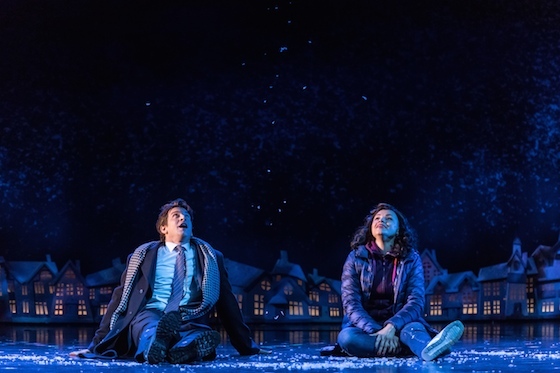 Groundhog Day enjoyed a hugely successful and critically acclaimed 10 week season at the Old Vic Theatre, London, in the summer of 2016, only a couple of weeks ago winning FOUR 2016 BroadwayWorld UK/West End Awards including Theatrical Event of the Year! 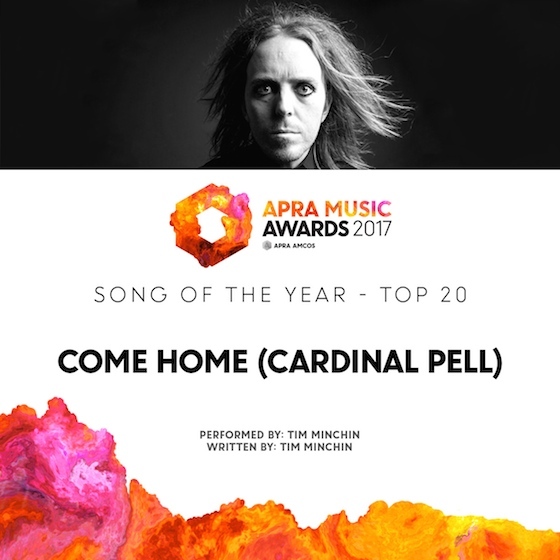 ‘Come Home (Cardinal Pell)’ has been shortlisted for the 2017 APRA Song of the Year! APRA members across Australia have voted to shortlist Come Home (Cardinal Pell) for the 2017 APRA Song of the Year. This is the largest peer-voted music award in Australia. The Top 20 will now be voted on by a specialist Voting Academy, consisting of previous nominees from the Awards’ 23 year history, with the nominees announced in early March. For more information head to the APRA website. There’s even an APRA Song of the Year Top 20 playlist on Spotify, which you can listen to for free here or if you use the Spotify app, search for user: apraamcos to find the playlist. Here’s Tim’s blog, from February last year, about why he wrote and released the song as a charity single and his follow up statement. Rehearsals are underway and the marquee is up for Groundhog Day Broadway! 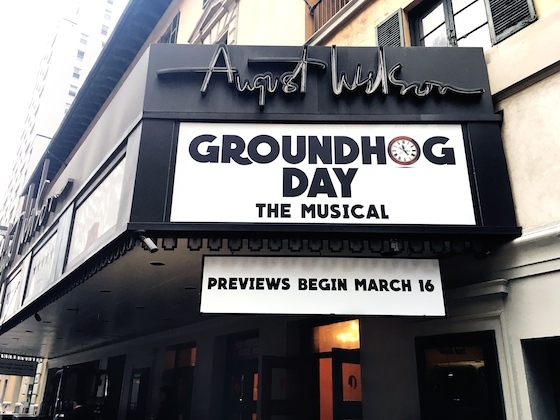 Rehearsals for the Broadway production of Groundhog Day got underway last week and the marquee has gone up at the August Wilson Theatre! As the sign says: previews begin March 16th, 2017, with the official Groundhog Day opening night on April 17th, 2017. Tickets are on sale from Ticketmaster.com or by calling (800) 745-3000. Barrett Doss will play Rita Hanson. Joining them are Rebecca Faulkenberry, John Sanders, Andrew Call, Raymond J. Lee, Heather Ayers, Kevin Bernard, Gerard Canonico, Rheaume Crenshaw, Michael Fatica, Katy Geraghty, Camden Gonzales, Jordan Grubb, Taylor Iman Jones, Tari Kelly, Josh Lamon, Joseph Medeiros, Sean Montgomery, William Parry, Jenna Rubaii, Vishal Vaidya, Travis Waldschmidt and Natalie Wisdom. Four 2016 BroadwayWorld UK/West End Awards for Groundhog Day at The Old Vic, including Theatrical Event of the Year! 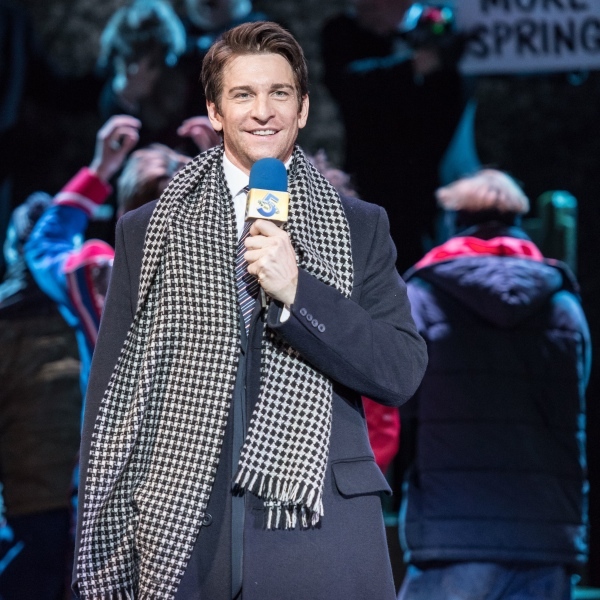 Groundhog Day at The Old Vic Theatre has won FOUR 2016 BroadwayWorld UK/West End Awards including Theatrical Event of the Year! Best Direction of a New Production of a Musical – Matthew Warchus, Best Set Design of a New Production of a Play or Musical – Rob Howell and Best Lighting Design of a New Production of a Play or Musical – Hugh Vanstone. You’ll find the full list of 2016 BroadwayWorld UK/West End Awards winners here. Groundhog Day opens on Broadway this spring. Yesterday saw Matilda’s final Broadway performance but a NEW US Tour starts January 12th 2017! Yesterday evening, following a sensational, Tony Award winning run, Matilda The Musical closed on Broadway, but our eponymous hero is off on a NEW US Tour which launches January 12th, 2017! 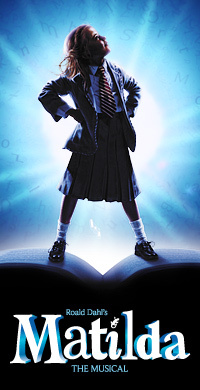 Matilda opened on Broadway in April 2013, to marvellous reviews and has delighted audiences across a run comprising 1,555 performances, on top of 37 preview performances. Direct from the Toronto show, Hannah Levinson, Jaime MacLean, and Jenna Weir share the title role. The principal cast features: Paula Brancati (Miss Honey), Dan Chameroy (Miss Trunchbull), Keisha T. Fraser (Mrs. Phelps), Brandon McGibbon (Mr. Wormwood), and Darcy Stewart (Mrs. Wormwood). Tickets for the US Tour are already on sale here.